General’s Rip-R-Stripper™ floorcovering stripper is an ideal solution for removing carpet, ceramic tile, linoleum, hardwood flooring and mastics. Powered by a 3/4 horsepower electric motor, the Rip-R-Stripper offers low noise levels and high productivity with multiple removal accessories. 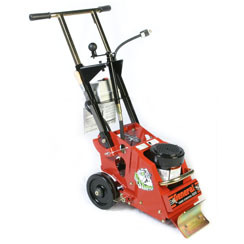 With an exciter unit mounted directly to the driveshaft, the scraper uses down-ward force to bore into and strip away applied floor coverings and adhesives.